Posted on behalf of Smithsonian Early Enrichment Center Executive Director Kimberlee Kiehl. When was the last time you tried something just because you were curious? When was the last time you visited a place just because you wondered about it or you just wanted to know more? When was the last time you asked yourself or someone else a good question and then looked for the answers? Young children spend many hours during their days doing just this….trying new things just because they are curious, exploring the world around them just because they wonder about it, and asking questions about what they know and don’t know. Here at SEEC our teacher curate experiences for children that allow them to do what Sugata Mitra calls “wandering aimlessly around ideas.” We give children time to explore an idea or concept in multiple ways over an extended period of time and encourage them to search for knowledge through this exploration. We also know that questions are vital for learning and discovery and we help children learn to ask good questions and then to search for the knowledge that they are interested in rather than simply feeding them information. In his recently published book “A More Beautiful Question: The Power of Inquiry to Spark Breakthrough Ideas” author Warren Berger discusses the power of questions– how they can result in change and how essential the ability to ask good questions is to growth and learning. A lesson at SEEC often starts with questions from the children. For example, one of our classes of four year olds recently were very interested in caves. This interest grew naturally out of a study of The Wizard of Oz. You might be wondering how…follow me here while I walk you through 4 year old logic….Wizard of Oz—Emerald City—emeralds—mining—caves! 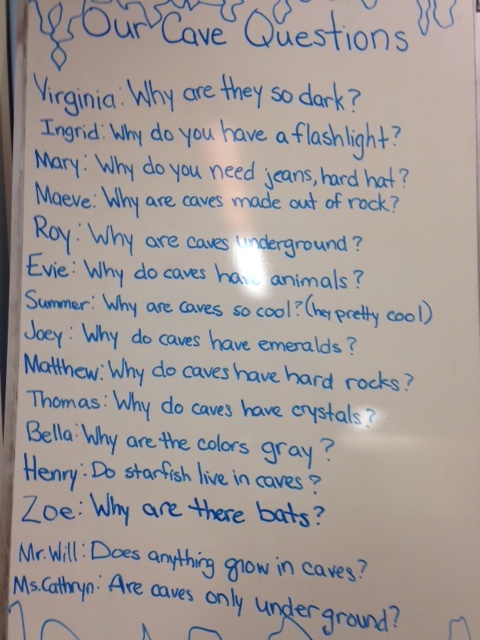 Look at the photo of their fantastic questions about caves! Over the course of several weeks they explored these questions and more, visiting museums and using the community and technology to find answers and explore ideas. Children who learn how to ask good questions will be adults who know how to ask good questions. Adults who know how to ask good questions are good leaders, change makers, and innovators. Unfortunately, as adults we too often squelch children’s questions rather than explore them. We are hassled by their questions, joking about how often a toddler asks why, instead of reveling in the sheer beauty of the questions. Even Einstein knew the beauty of a good question and attributed his genius in large part to his ability to question. Imagine how beautiful education could be and how rich life would be if we all just spent more time asking beautiful questions and searching for information. This entry was posted in Families and Museums. Bookmark the permalink.